Romance has always been the favourite genre of Bollywood and with time, even the movie titles seem to have gone through changes. Move over the term 'shaadishhuda', here comes this week's release LOVESHHUDA that stars Girish Kumar alongwith Navneet Kaur Dhillon. Will this film turn out to be a 'love' affair with the box-office or will it fizzle out, let's analyze. The film starts with Gaurav (Girish Kumar) welcoming his Indian friends to London and escorting them to his house, where the preparations are underway for his marriage to a certain Vandana. Before the big day, all of Gaurav's friends insist on celebrating his bachelor party by having a night out. What follows after that is an overdose of booze that lands Gaurav up in bed with a rank stranger named Pooja (Navneet Kaur Dhillon), who happens to be an Arts student. The funny part is that Gaurav simply doesn't remember how he landed up in the bed with Pooja. Gaurav, who suffers from a nasty hangover, tells Pooja to leave his room immediately. Since Pooja misplaces her top in the room, Gaurav gives his white shirt and asks her to leave. As luck would have it, the white shirt happens to be a gift by Vandana's mother to Gaurav for the wedding. When the extremely finicky and over possessive Vandana asks about the whereabouts of the white shirt, Gaurav starts hunting for Pooja to get the shirt back. What happens after that are a series of meet ups and break ups, which ultimately leads to Gaurav living upto the film's title 'loveshhuda'. In couple of years, when Gaurav undergoes a divorce from his wife Vandana, his friends insist on travelling to Mauritius in order for him to loosen up a little. And as destiny would have it, Gaurav bumps into Pooja again, who has come for her bachelorette party with her friends. When Gaurav tries to rekindle his love, she tells him that she is on the verge of getting married to Vinayak Sengupta (Yash Pandit). Does Pooja end up marrying Vinayak or does she go back to Gaurav, does Gaurav mutter up the courage to confess about his love before everyone, what happens to the 'loveshhuda' birds Gaurav and Pooja in the end.... forms the rest of the story. 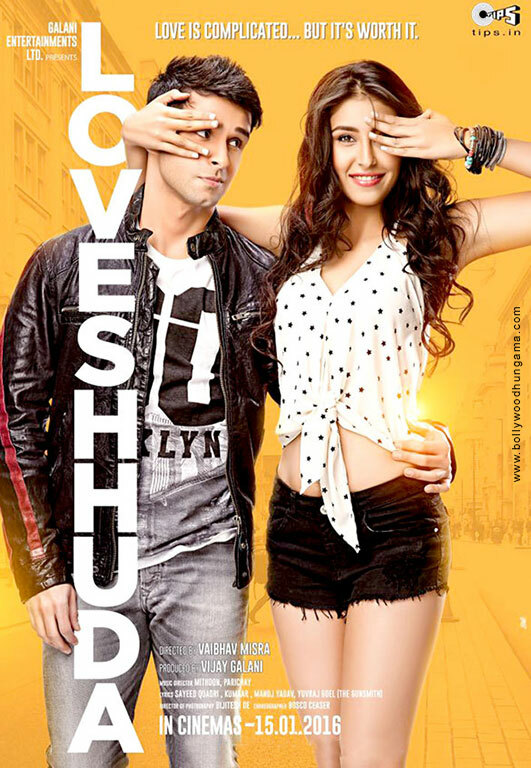 LOVESHHUDA marks the directorial debut of Vaibhav Mishra. With LOVESHHUDA, Vaibhav Mishra (who also doubles up as a scriptwriter) has tried to tell 'a love story that starts in bed'! The sad part is that he fails miserably in doing so. While the first half of the film shows promise and sets up the pace of the film (drinks overdose and drunk scenes notwithstanding), the second half of the film goes totally offtrack. The second half sees the film and the script going astray, thus making absolutely no sense. The whole film is 'dominated' by an overflow (read 'overdose') of alcohol and hangovers. The film's screenplay (Vaibhav Misra, Hussain Dalal) is literally inspired by many superhit Hollywood and Bollywood romantic movies, with many signature scenes from the old classics simply recreated in this film. As for the performances, the film's lead actors Girish Kumar and Navneet Kaur Dhillon make up for a good and fresh pair onscreen. Girish Kumar (who was last seen in his debut film RAMAIYA VASTAVAIYA) shows growth as an actor. While he has his set of struggles while handling emotional scenes, he does come across as a sincere actor who yearns for a proper script in order to showcase his talent. LOVESHHUDA is not that script which gives him that space. The film also sees the debut of 'yet another beauty queen turned actress' in the form of Navneet Kaur Dhillon, who delivers a decent performance (strictly in parts) in the film. Despite LOVESHHUDA being her debut film, she shows promise, but needs to polish her acting skills. The seasoned actors like Tisca Chopra and Sachin Khedekar do justice in their respective characters. The rest of the cast help the film in moving forward. The music (Mithoon, Parichay) of the film is very youthful and trendy, and should connect well with the youth. The film's background music (John Stewart Eduri) is decent but way too loud at some places. While the cinematography (Bijitesh De) is good, the film's editor should have really reduced the length of the second half which is stretched endlessly for no reason. On the whole, LOVESHHUDA is an amalgamation of famous rom-coms from both Hollywood and Bollywood with good music but fails to make an impact as it offers nothing new.